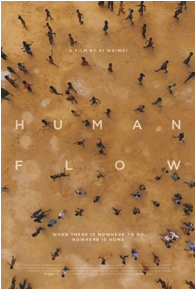 Ai Weiwei’s new documentary, Human Flow, filmed in 23 countries to document refugees all over the world, will be released October 13, 2017. On November 16, 2017 it will be 38 years since my mom and I left the Soviet Union as Jewish refugees with the help of Hias. January 29, 1980 we landed at JFK in NYC, after traveling for two and half months through Europe while Hias raised money for us to get from one place to the next. In that time we lived in small hotel rooms and tiny apartments rented for us by Hias in Vienna and Rome, along with groups of other refugees. We were so very lucky that Hias was taking care of us. Not everyone has that privilege. This trailer and every image of refugees shatters my heart. We must work harder and do more. The official trailer, released today, below. World Humanitarian Day (WHD) is held every year on August 19 to pay tribute to aid workers who risk their lives in humanitarian service, and to rally support for people affected by crises around the world. This entry was posted in Film and tagged Ai Weiwei, HIAS, Human Flow, Humaniatrian, Refugees. Bookmark the permalink.